The Plough Inn (5 mins) Rest! Jubilee Park: StreamStone (14 mins) Bench! Stonebow Washlands (27 mins) Bench! Stonebow Bridge: K105/K70 to Hathern (31 mins) Perch! Coe Avenue and The Obelisk (48 mins) Perch! Kenilworth Ave: Interpretation Board (55 mins) Bench! The times given are for a fairly brisk walking pace, double them for a very leisurely stroll! The waymarked route will be signed by finger posts which we hope to purchase and install in the early Spring 2000. This will be one of the last items to install. The walk starts from Thorpe Acre Green. Although this is our village Green today, it hasn't always been so. Before the war, when the estate didn't exist the path across the green was the main Thorpe Road from Shepshed. The land on the south side of the green was allotments, on the other side it was fallow. The mosaic will show a map of the route we are following, with lots of local detail. Walking toward the church, you can imagine you are walking into the old village. The shops on the right, are called the 'Vil' by local children. Although they are relatively new, they do represent the village shops. All Saints Church in Thorpe Acre village. The Church was built in 1845 and extended in 1968, as the estate grew larger. The Church Hall used to be the local village school and a Rectory stood behid it on land now occupied by bungalows. The Church is the anglican church of the parish of Thorpe Acre with Dishley. Dishley church is an old ruin on the Derby Road. Robert Bakewell, the early geneticist, is buried there. Proceeding along Thorpe Acre Road we pass old farm buildings on the left (Barnett's Farm), and old two cottages. The cottages remind you what the old village was like perhaps. The Express dairy depot was also a farmyard before the estate was built. The Plough is at least 150 years old. It sits with its back to the road. This was the heart of Thorpe Acre village. Up the lane on the left ran the road to Knightthorpe and to Loughborough. We call it the white Bridge because that's what everyone else called it due to its white rails. You're now walking along the Black brook, upstream. half a mile downstream was the old Dishley Mill, you can see Gorse Covert wood on the hill to your right - across the marshy moors. Except it's Safeway's car park. Safeways today, but take a walk down memory lane and you may remember Ye Olde Presto Shoppe. And before Presto, twas Keymarkets, and before Keymarkets, legend doesn't record. The shopping centre was established in the early Eighties together with a Community Centre. Here, on a weekday, you'll get coffee, a snack, company or you can join a youth club. Introduce yourself to Lesley and Mike Hamilton who run the centre. Don't walk behind me, I may not lead, don't walk in front of me, I may not follow, just walk beside me and be my friend, Albert Camus. We're off again, maybe In Tandem, maybe walking, maybe running. Alomg the brook, passing Safeways, passing the Community Centre, there's another white bridge. All steel and struts this one. Cross it and you'll be in Jubilee Park. Swings, things, pitches and ditches. We've planted more willows. Soon they'll be more life along the back. Staying on the north bank, you'll notice a stone carved by Christina Purnell. We've called it 'stream stone'. When it rains a pool will form in the lead bowl. In heavy rain it will overflow causing rivulets down its sides. Climb up to Buckingham Drive, or if it's too steep, take the path to the left round Amis Close. From the bridge you can see the hawthorne and elm hedgerows that have been planted. Blackbrook Way takes you along the Black brook, past banks of Himalayan Balsam in August, to a bridge carrying Mount Grace Road over the brook. Take the bridge. Mountgrace Road leads to a newly built part of Thorpe Acre. Taking their theme from nearby ruined Garendon Abbey, the roads are all named after ruined abbeys of England. The meadows either side of the road are carefully managed and very fine. The meadow to the east is cut to encourage wild flowers. The land to the west is graced by a wooden sculpture of the Kingfisher, diving into water. The wandering Dong through the forest goes!, Edward Lear. 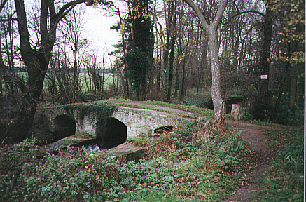 Stonebow is also known as the Roman bridge. To the north lies Bailey's Plantation and the route to Pear Tree Lane, Hathern or Dishley chapel. A sculpture by Charlotte Evans: Adam's Rib is mounted on a tree above the bridge. The footpath from Stonebow Bridge is not currently in good condition. If you can take this, however, within 100 meters south you will find a much better surface. Here you have reached the ancient wall to Garendon Deer Park. Back Lane or Garendon Lane as it used to be called, is a major footpath, bridleway and the part of the National Cycleway that leads from Leicester to Derby. To the west is the Bavarian Gate designed by William Railton, architect of Trafalgar Square. The Deer Park to the south is closed to the public but is rich in history and monuments. Route to Shepshed: the County Council has already installed our 'out of town' waymarking leading us into the open countryside. These are the traditional yellow-top posts, funded from the council's Waymarking 2000 project. They mark the three major public rights of way: K68, K70 and K109. Yellow arrows for footpaths, blue mark bridleways. And did those feet in ancient time. William Blake. National Millennium Cycleway to Dover. Here is a carved stone sculpture: Change by Will Nossiter. This is the Jelson estate which was buolt around 1971. Rupert Brooke Road was built around 1951. Brush Traction regenerating Loughborough. We are planting a Millennium Oak nearby. Each finger-post will indicate the route of the Thorpe Acre Trail and will include a line of poetry or quotation, as given in italics above. The mosaic itself is an illustrated map of the route. We hope to produce an audio tape to accompany the leaflet which is deliberately designed for people with visual disabilities.